When I first moved to my current home town and before I had children, I had NO earthly idea what one of these was. By the time Lilly was about three months old and I was venturing out into the world of real people, I knew. I knew I didn't have one, couldn't fathom spending that much money on one and realized we were too poor to own one anyway. Fast forward two and a half years from the birth of Lilly, and during the gestating of James, I decided I had to have one of these angelic, cure all strollers. There was a problem though. We did not, and still do not, have the money to spend willy-nilly on such an expensive baby item. I turned to craigslist and found a used one for 1/4 of the money and have used it almost every day. It did not cure James of his ISSUES, but it was nice to have so we could walk him around during the REALLY hard times. I will admit that the stroller maneuvers around unlike the other baby carrier I had with Lilly and was worth the USED price I paid. I am telling this story for one reason. I HATE THE BUGABOO. It is hard to put together EACH AND EVERY time I need to use it. It doesn't fold up with one hand and the left rear tire is constantly going flat and I have to go to the gas station to Macgyver the broken tire and the .25 cent air hose together so I can just get a little bit more out of the thing. I am not having any more children, and I refuse to buy another stroller. Anyway, today while at the mall, which I despise anyway, I was trying to get the thing out of the back of the car and unfold it to put the seat on, it fell on my toe. I cussed in front of the kids. I sat on the ground and continued to cuss until a man came by and asked me if I needed help. I felt a little stupid saying, "No, the stroller fell on my foot." I was acting like a car ran over my body and I had been left for dead. No one ever said I wasn't a drama queen. So I managed to collect myself, my kids and my merchandise for exchanging. We did what we came to do and headed for the Cheesecake Factory for a quick bite to eat. I have eaten there maybe five times in my life and I forget. Each time, I forget. 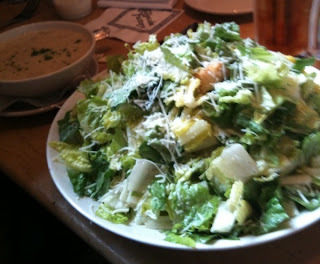 Order a lunch size portion of a Caesar Salad, and you get this. Have you ever seen a bigger salad? This is just the lunch sized portion. What does the regular salad look like? I could not wrap my head around how big this salad was. I even asked our sixteen year old waitress if this was the correct salad. I mean really? And why wasn't our waitress in school? This is obviously a post for a different day, but still, I was so thrown off by the size of the salad, I couldn't concentrate. I even forgot about how bad my toe hurt. We ended the day, after ballet and a trip to Starbucks with our favorite friend, by having pizza and watching Charlie Brown. Good Grief! What a day! Wow, life. I guess perspective is a big issue. I have felt so badly about Haiti and then we have the idiots Rush Limbaugh and Pat Robertson, who give bigotry a bad name. God bless the poor people.